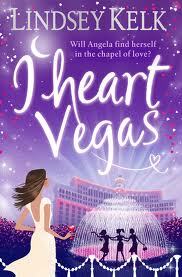 My Series Sunday pick is I Heart Vegas, the 4th book in the I Heart series by Lindsey Kelk. Angela is living with her indie band boyfriend in New York. She loves her new life in the States, but now she may be forced to return back to London. Her visa is expired! She no longer has a job. And she's trying to keep it all from her boyfriend. Best friend Jenny-from-the-block plans a getaway trip to Vegas. You can just imagine the fun and trouble they get into in Sin City. As usual, I love the writing of Lindsey Kelk. She is a great chick lit author. You can get your career started as an author with the Guide to Career Education. Kelk's books are perfect for what I call "mindless" reading. I don't have to think too hard about the plot. Just sit back and enjoy each page. But there were moments when Angela just bothered me. Her actions were annoying during this book. I looked forward to the scenes with Jenny more. You can read I Heart Vegas as a standalone even if you didn't read the previous I Heart books. The reading is light, fun and easy. Though I am really looking forward to the next book of the series: I Heart London. NOTE: This book may not be available to United States readers.